May of last year was when I officially became a vegetarian. While I had mostly stopped eating meat in April, I really officially became a vegetarian in May. 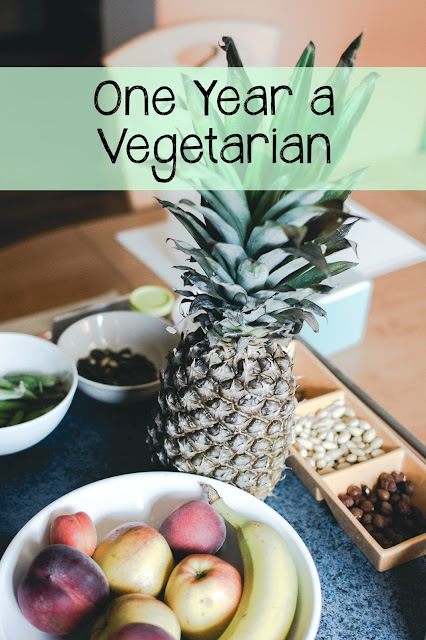 I haven't really talked about being a vegetarian on my blog, not because it's super personal or anything, but I just honestly haven't gotten around to it. I became a vegetarian for moral reasons - animals are treated horribly today and I don't think how they are thought of simply as products is right at all, and it makes me so sad to think about the cruelty they face in meat factories. On the flip side, I definitely don't judge others for eating meat. I know it's a hard decision to make and just generally a difficult thing to commit to for some people who love meat. My family was really concerned when I became a vegetarian because they wanted to make sure I got all of the necessary nutrients, so my parents made me do a lot of research about any supplements I would need to take, or certain fruits and veggies I should eat more of. Becoming a vegetarian was really easy for me because I've never been a huge meat eater. The only meats I really liked were turkey and chicken, but even then they definitely weren't my favorite food. Actually, the most difficult part of being a vegetarian so far has been when I'm at other people's house and they fix meat and something with wheat in it - my choices are then super limited to say the least. I usually just try to give people a heads up, and being in college now, it really doesn't come up a whole lot. Now that all of my family is used to me being a vegetarian, it's not difficult to have other things to eat besides meat at family gatherings and holidays. Another difficulty I've faced about being a vegetarian is actually not from my own doing, but questions and criticism from other people. My family especially was confused and concerned about whether or not I would be able to get the proper nutrients from fruits and vegetables alone. My dad really loves meat, so he didn't get why I would voluntarily remove it from my diet. My mom was just worried that I wouldn't get enough nutrients, but in time they both accepted the fact that this was a permanent change for me. Some people I've met have also been surprisingly critical of being a vegetarian and simply don't understand why I became one. It's sometimes frustrating when people do this because I never ask them why they eat meat and choose to do so. I've never been critical of anyone who eats meat; I believe it's a personal choice, and neither is more right. It's just how I choose to live my life and it really doesn't affect anyone but myself. So far, I've only missed eating meat during Thanksgiving. I have always loved turkey, so it was hard watching everyone else eat it, but I just took some extra mashed potatoes ;) There are actually so many meat-free dishes you can make during the holidays, and they have tofurkey! I have never tried it but I definitely will next year. Other than Thanksgiving, I haven't felt like I'm missing out on anything. There are substitutes for virtually every meat nowadays, so if I ever have a dire craving for a cheeseburger I can easily eat a veggie burger. Honestly, I like veggie burgers way more than I ever liked regular cheeseburgers! I think it just comes back to the whole non-meat fan growing up, but veggie burgers taste so much better to me. Well, anyway, I don't want this post to rattle on and on about the woes of the world and environment, so I'll leave it at that! It's just important to myself that I kind of recognize that it's been a year without meat. I'm so glad I decided to make the switch to vegetarianism and I think I'm going to start posting more about things like vegetarian recipes, tips, etc.! Is there anything you've dedicated yourself to? Also love your new blog design! Yeah it really does! Haha I guess I just don't understand why people are so disturbed by it. Wow! It seems like the first year has gone well for you. I really like meat and I did last seven weeks without it one time, but I did go back to eating it long term. This is very exciting I always wanted to try and be a vegetarian but I found it hard, good job! Thank you!! And yeah it's so personal - it drives me crazy when people want to argue with me about it! Haha yay Hi-5!! well done for sticking at it! i don't think i could go vegetarian, but try to have 2-3 meat free days a week which i really enjoy! Thank you! :) And yeah, cutting it down slowly is the best way to do it! I am also a vegetarian, now a "vegan," though I try not to mention it, because I've found it really freaks people out... my husband and I have also had to deal with criticism and questions, him especially. Still, we know, like you said, that it is absolutely the best for us and we've never felt healthier or happier! Great job! Keep up the good work! Thank you so much! And yes exactly! As long as we're happy, no one's opinions matter!